I would really like to have known Aunt Eliza Eggleston Barron. The glimpses we have of her, especially from her letters, give me the impression she was quite spunky and would have been an entertaining storyteller. Her life was not necessarily easy and was not very long. Eliza Eggleston Barron was born March 25, 1810 in Marcellus, Onondaga, New York. Family records had estimated her birth as 1802, but there appeared to be confusion with her sister Electa. Eliza was the youngest daughter in the family. In genealogical information sent by Orson to his father in 1876, he gave this birth date for Eliza. Eliza died November 4, 1869. Eliza married Carr D. Barron May 9, 1840 in Owasco, Cayuga, New York. He was born February 15, 1809 in Owasco, Cayuga, New York. Eliza and Carr Barron moved from Springwater, Livingston, New York to Michigan, apparently before her sister Electa and family came. Later in the later she mentions, as if she forgot and then just remembered, “”Ansel has 3 boys.” Eliza also shared with Samuel some information about a contact with another Eggleston regarding genealogy. She seemed to want direction from Samuel about how to respond to this person. If this Rev. A. Eggleston was crazy, as Eliza says, then I must be too. I understand the mindset of a genealogist trying to gather family information. In fact Eliza’s nephew Orson asked for the same kind of information when he visited her family while on his mission. 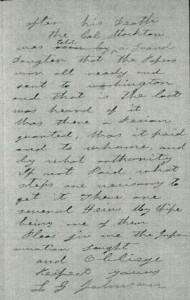 In a letter to Samuel dated March 5, 1873, their brother Ambrose wrote that he did not know where Eliza was. “I have had no correspondence with her since I moved into Allegany.” Apparently they had not kept in touch, and he was not aware of her death. At the time Orson was on his mission in Michigan in 1876, Eliza was dead. He did spend some time there with his Uncle Carr and cousins. Eliza Eggleston Barron died of cancer November 4, 1869 in Groveland, Oakland, Michigan. Unfortunately her death record does not give her parents names and has her birthplace as New Jersey, not New York. Death Record for Eliza Barron, the last entry showing on this image. Eliza was buried in the Ortonville Cemetery in Oakland County, Michigan. There is a large Barron marker there. After Eliza’s death, Carr married Sarah M. Beach Thurston March 2, 1870. She was born July 6, 1812 in Gates, Monroe, New York. They had no children. Old family letters give some great information and wonderful insights into the lives and relationships of our ancestors. Some family letters written to Samuel Eggleston were included on typed sheets I found with records of Theron Eggleston at the home of his daughter Ruth. 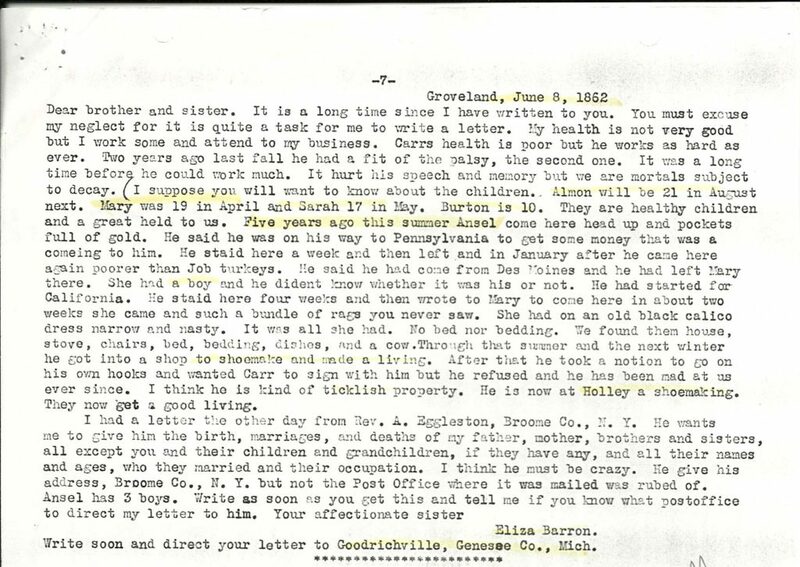 With these letters were others with genealogical information that Orson Hyde Eggleston gathered while on his mission and genealogical correspondence. These had all apparently been transcribed by Theron or his wife. I don’t know what happened to the original letters. I found this correspondence to be quite interesting. The family letters give some insights into personalities and family relationships as well as provided some genealogical clues which were helpful in my research. This earliest letter, dated 1862, was to Samuel Eggleston from his sister Eliza Barron. Samuel had recently migrated from Iowa to Utah. Eliza passed away in 1869. Eliza mentioned their brother Ansel, who was somewhat of a mystery – to us, and possibly to them. This letter provided clues to help me find him in records in Michigan, where he died in 1871. We also get a glimpse of personalities from the things Eliza said about her brother as well as the colorful way she expressed herself. I would like to have known Aunt Eliza. Eliza also mentioned a letter from Rev. A. Eggleston, who would be the Ambrose Eggleston mentioned in later genealogical correspondence. This letter to Eliza may have begun that correspondence. 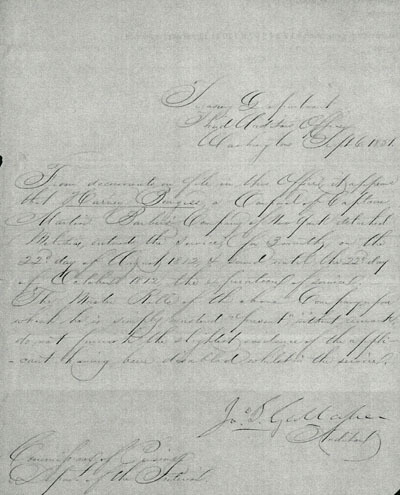 Early members of the Church of Jesus Christ of Latter-day Saints were encouraged to search out their family genealogies in order to provide baptisms for their dead family members. Samuel and Lurania Eggleston were the first of our family to join the LDS Church. I am not sure if Samuel did any active genealogy, but it does appear that he encouraged his son Orson in efforts to gather information. While on his Mission in Michigan during 1876-1877, Orson visited family members and obtained names and dates. He wrote to his father several letters with such information. I don’t know what happened to the original letters. It appears that at some point Orson’s son Theron, or his wife, transcribed these letters. I found several typed pages of letters when I visited Theron’s daughter Ruth. I made copies of them. They were all typed on numbered legal size sheets and include some notes made by whoever transcribed them. Included with these letter were correspondence with W. E. Hagens and other letters from Orson to his father and from family members to Samuel. There is also some question about whether Orson kept this information himself or simply sent it on to his father in these letters. Orson went to the Logan Temple in 1914 to do proxy baptisms. The records of the work done then do not fit exactly the information in these letters. There is a possibility that some of the handwritten information was misread or typos made when typing them up. 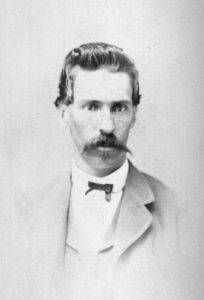 Orson Hyde Eggleston served a Mission for the Church of Jesus Christ of Latter-day Saints in 1876-1877. He was called at the General Conference of the Church on October 7, 1876. Years ago, after learning that Orson Hyde Eggleston had kept a journal of his Mission to Michigan, I went to the Church History Library to see this Journal. This was when the Church History Library was located in the Church Office Building, before the beautiful new building was built. The procedure to view items in the Archives required checking in with ID, leaving everything I had brought with me in a locker, except a pencil and paper. No electronic devices allowed, though a cell phone with a camera was not something I even had then. Items were requested and then brought to a viewing room. I painstakingly transcribed – by hand – the entire journal. It is not a very long journal, and in a very small notebook. I then went home and typed from my notes a two page transcription of the journal. 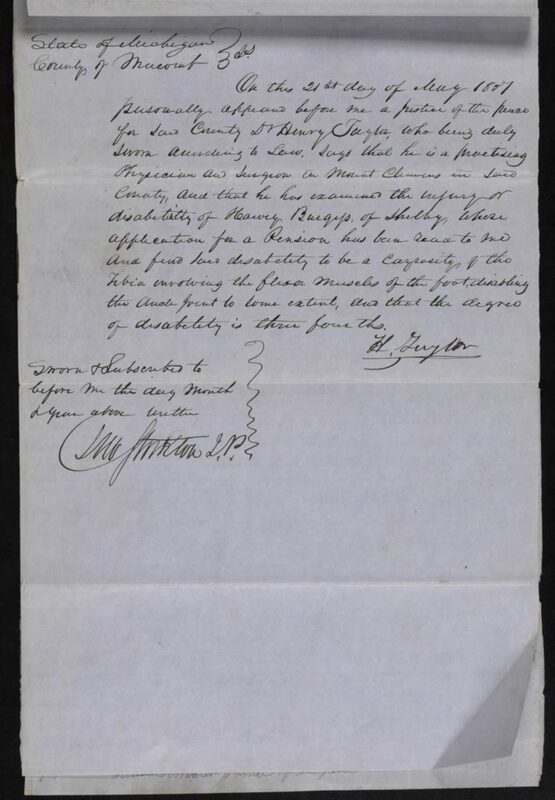 What an unexpected surprise to learn that Harvey Burgess, father of Lurania Powers Burgess Eggleston, not only served in the War of 1812, but was injured and left somewhat disabled for the rest of his life. I recently joined the Daughters of the American Revolution, using Seth Burgess as my Patriot ancestor. His service in the Revolution was documented in the Joseph Eggleston book. 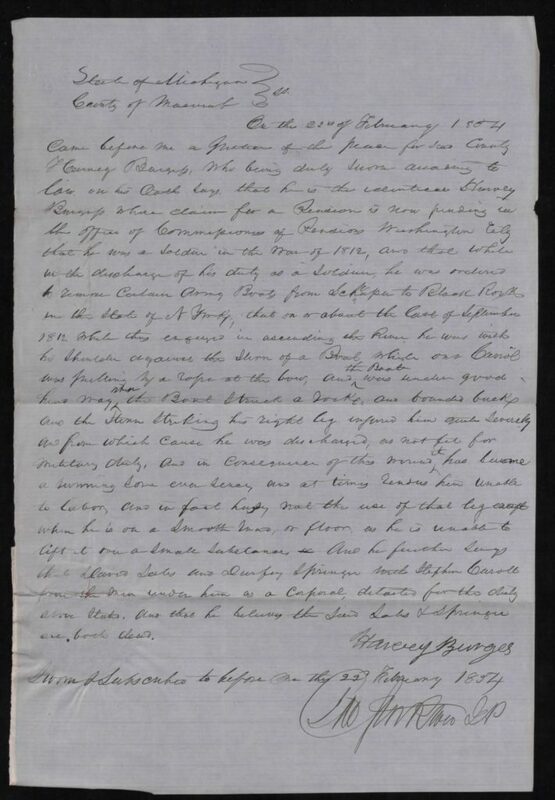 In the process of documenting family relationships and birth and death places, the DAR registrar found in the newly digitized War of 1812 Pension Files this new information. Harvey Burgess, the son of Seth Burgess, was living in Sempronius, New York at the time of the War of 1812. He apparently enlisted with some other men from Sempronius, including his brother-in-law Stephen Carroll. He served from August to October 1812. 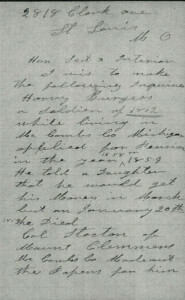 On this 21st day of May 1851 personally came before me a Justice of the Peace, for said County, Harvey Burgess aged seventy two, a resident of Shelby in said County, who being duly sworn, declares, that he is the identical Harvey Burgess, who was a soldier in the Company Commanded by Captain Martin Barber in the Regiment of New York Militia Commanded by Col. Henry Bloom in the War with Great Britain, declared by the United States on the 18th day of June 1812, that on or about the 1st day of August 1812 aforesaid, he was called into the service of the United States for the term of three months, and that while in said service, on or about the last days of September 1812 aforesaid, that he was detached for what was called Boat duty, in removing the boats of the United States from Schluper in the State of New York to Black Rock in said State, while thus employed he received a severe injury on his right leg that prevents him from performing further duty and that said injury or disability has continued to ca.. and at times renders him wholey unable to labor for his support. And he further says that the reason why he has not heretofore made application for a pension was a desire on his part to live without calling on the Government for assistance, that as he advances in years, the injury or disability became more disturbing and painful, and renders him less able to labor for his support, consequently he makes this application for a pension which he feels entitled to receive from his country, from the fact that he cannot now do but little towards his support by reason of said disability. 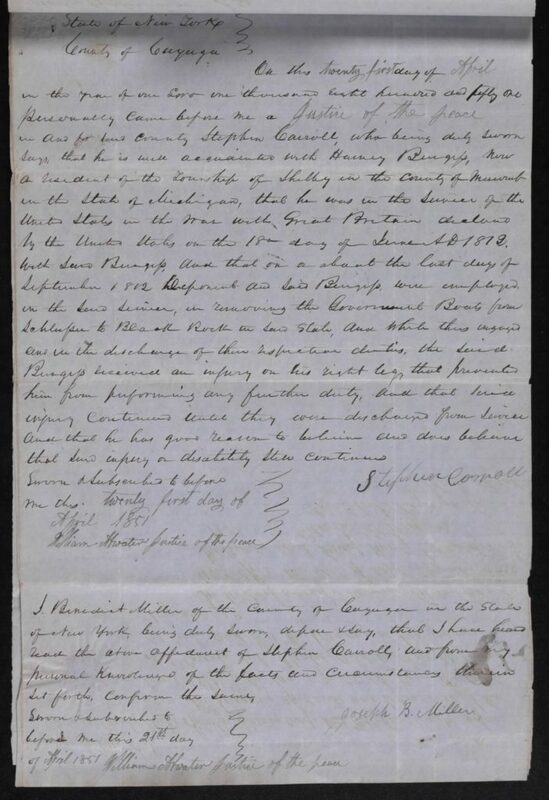 And he further declares that the Officers above mentioned, are dead, but that Joseph B. Miller, whose affidavit is herewith amended, was a soldier in the same company, as also a Stephen Carroll, who was present when deponent was injured, and the deponent received no regular discharge. On this twenty first day of April in the year of our Lord one thousand eight hundred and fifty one personally came before me a Justice of the Peace in and for said county Stephen Carroll, who being duly sworn says that he is well acquainted with Harvey Burgess, a resident of the township of Shelby in the County of Macomb in the State of Michigan, that he was in the service of the United States on the 18th day of June AD 1812 with said Burgess, and that on or about the last day of September 1812 deponent and said Burgess were employed in the said service, in removing the Government boats from Schulpler to Black Rock in said state, and while thus engaged and in the discharge of their respective duties, the said Burgess received an injury on his right leg that prevents him from performing any further duty, and that said injury continued until they were discharged from service and that he has good reason to believe and does believe that said injury or disability still continues. 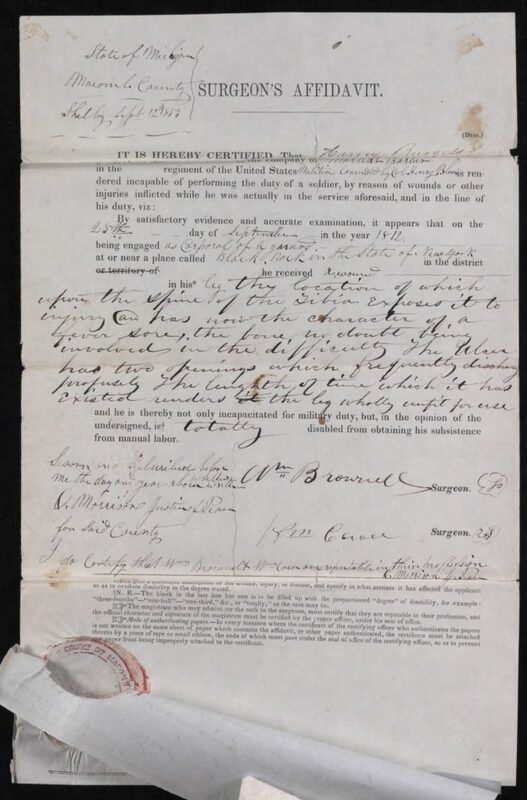 On this 21st day of May 1851 Personally appeared before me a Justice of the Peace for said County, Dr. Henry Taylor who being duly sworn according to law, says that he is a practicing physician and surgeon in Mount Clemens in said county, and that he has examined the injury or disability of Harvey Burgess of Shelby, whose application for a pension has been read to me and finds said disability to be a carposity of the tibia involving the flexor muscles of the foot, disabling the ancle joint to some extent, and that the degree of disability is three fourths. wound in his leg by the location of which upon the spine of the tibia exposes it to injury and has now the character of a fever sore, the bone, no doubt being involved in the difficulties. The place has two openings which frequently discharge profusely, the length of time which it has existed renders it the leg wholly unfit for use.. . and he is thereby not only incapacitated for military duty, but, in the opinion of the undersigned is totally disabled from obtaining his subsistence from manual labor. The 1850 Census is the only one with an occupation listed for Harvey Burgess. He was living then in Shelby, Macomb County, Michigan next door to his son Zadock. Other sons Stephen, age 21 and Charles age 27 with his wife and child lived with Harvey and Mary. His occupation is listed as “cooper” the same as Zadock. They were likely in business together, but because of his injuries and age Harvey was probably limited in the actual work that he did. Charles and Stephen were listed as farmers and probably helped to support their parents. Harvey Burgess a soldier of 1812 while living in McComb Co Michigan applied for pension in the year 1854. He told a daughter that he would get his money in March but in January 20th he died. Col. Stocton of Mount Clemmens McComb co Made out the papers for him after his death. The col Stockton was told by a grand daughter that the papers were all ready and sent to Washington and that is the last was heard of it. Was there a pension granted, that it paid and to whome and by what authority. If not paid, what steps are necessary to get it there are several Heirs they wife being one of them. Pleas give me the information sought and obliege. In spite of his service to his country and the lifelong disability he was left with, he never did receive a pension.